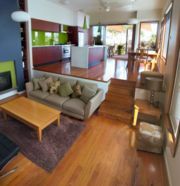 - Our house was originally a fairly typical inner suburban Victorian double-fronted timber home. In 2006 we decided to renovate and turned to Andreas and Judy Sederof from Sunpower Design. 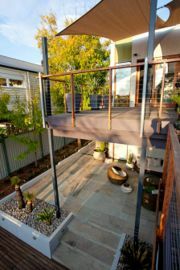 The brief was to create a contemporary home making the most of natural light, outside living & the valley views and with the best energy efficient and water saving initiatives. We also required an open plan office space where we could run our growing business, Open Spaces Publishing. + Our house was originally a fairly typical inner suburban house - a Victorian era, double-fronted timber home, in a street filled with similar houses. In 2006 we decided to renovate and turned to Andreas and Judy Sederof from Sunpower Design. 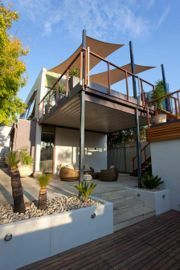 The brief was to retain the original facade, in keeping with the streetscape, and to create a contemporary light filled extension/renovation with extended outdoor living to make the most of the valley views and to incorporate the best energy efficient and water saving initiatives. We also required an open plan office space where we could run our growing business, Open Spaces Publishing.